Rewind to last Thursday night. My almost 7-year old (the one who is the whole reason I became a sleep consultant) came down with a double-whammy: Strep Throat and Influenza A. Yowsa! His fever was higher than ever before and because he has asthma, we were on super high alert to watch for any sudden signs of difficult breathing. Now, when we had our babies, we were never a family who considered bed sharing. I was just too scared about the risk factors (although we had plenty other sleep props in place). But last Thursday night, neither my husband nor I hesitated at the thought of letting G sleep with me in our bed so I could listen to his breathing and check his fever throughout the night. I knew in my head this was dangerous! G is the kind of kid that if you give him an inch, he will take a mile and this is especially true when it comes to sleep. When he was just over 3 years old, we had a sleep prop in place that was waking him (and us) up 3-5 times a night because we couldn’t muster up the nerve to set some strong boundaries in place. So for two nights last week he slept in my bed and I listened to his breathing and I didn’t sleep a whole lot. At one point I had to wake my husband up (who was now in the guest room) because I thought maybe it was time to take him into the ER instead of waiting until the morning. He was so snug as a bug in our bed and I knew he thought it was a special “treat” and would expect it night after night going forward. Sure enough, on night 3 when his fever was way down and no signs of difficult breathing in sight, my little G says, “Mom, I want to sleep in your bed tonight.” Ugh… here we go… pull out the toughness! I respectfully “declined” his request, just like I always coach my parents to do with young children’s bedtime requests. He asked again and again and I stuck to my guns. Luckily it wasn’t too hard and didn’t last too long and he got into his own bed. Whew! He woke a bit early in the morning and wanted to come into our bed. Again, I had to decline, knowing he was going to possibly put up a fight at 5am and wake his brother. But I also knew I had to stick it out. A rule is a rule is a rule. And I reminded him several times that now he is feeling better, back in his bed he stays! The next night we were back on track! With the crazy early start to flu season and everything else flying around, this may be helpful if you find yourself in a similar situation. 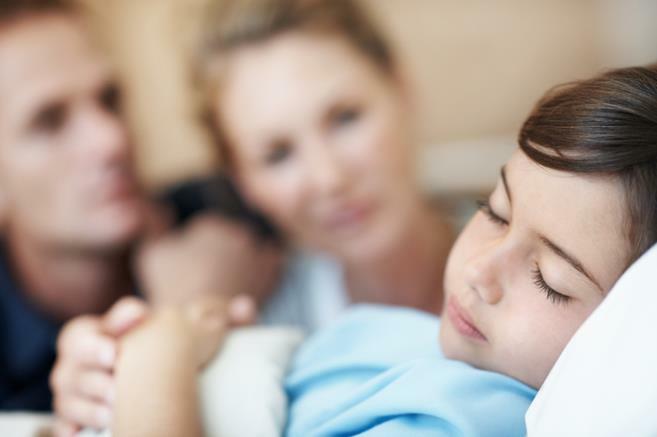 Always, always, treat your child’s illnesses with comfort, attention, and assistance to help them through any discomfort until they are on the mend. But once that is over, help them understand that the family is back to following the sleep rules of the house. And if you need help setting these boundaries or rules in place for your young children, I can help! Just set up a complimentary Let’s Get Acquainted phone call for me to learn a little more about your child’s sleep habits and we’ll take it from there.